The style of marmalade that we are familiar with today started in Dundee Scotland. 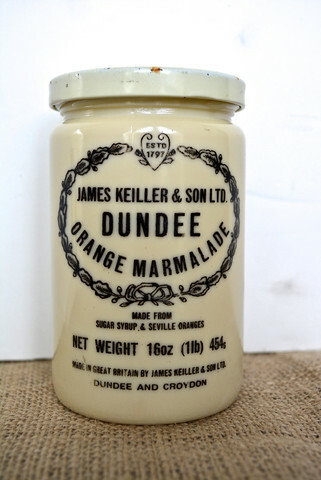 James Keiller and his wife Janet ran a small sweet and preserves shop in Seagate, Dundee. 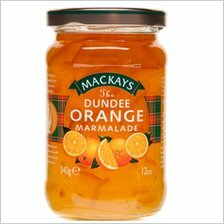 In 1797, they opened a factory to produce "Dundee Marmalade". It was distinguished by thick chunks of bitter Seville orange rind. The recipe was a new twist on the already well-known fruit preserve of orange marmalade but this recipe was spreadable, on toast. Legend has it in the 18th century when a Spanish ship took refuge from a storm, in the harbour at Dundee. On board was a consignment of Seville Oranges - which a local grocer decided to purchase. The Scots moved marmalade to the breakfast table, and in the 19th century the English followed. James Boswell remarks that he and Samuel Johnson were offered it at breakfast in Scotland in 1773. When American writer Louisa May Alcott visited Britain in the 1800s, she described "a choice pot of marmalade and a slice of cold ham" as "essentials of English table comfort". The recipe book of Madam Eliza Cholmondeley, dated around 1677 and held at the Chester Record Office 4, has one of the earliest recipes for a Marmelet of Oranges that compares to the marmalade we know today. One of Janet Keiller's great-great-great-great grandsons is the British television presenter Monty Don.